On 3rd October 2002, Aung San Suu Kyi was awarded the 2002 UNESCO-Madanjeet Singh Prize for the Promotion of Tolerance and Non-Violence. However, since then, the rulers of Myanmar have prevented her from receiving the US$100,000 prize. Aung San Suu Kyi winner of the 2002 UNESCO-Madanjeet Singh Prize for the Promotion Tolerance and Non-violence. Aung San Suu Kyi of Myanmar was named laureate of the UNESCO-Madanjeet Singh Prize for the Promotion of Tolerance and Non-Violence by UNESCO Director-General Koïchiro Matsuura today on the unanimous recommendation of an international jury. 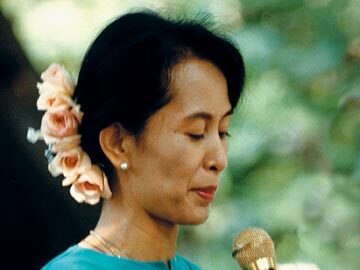 The Jury, presided by Nasser El-Ansary, Director General of the Institut du Monde Arabe (Paris), declared: "Aung San Suu Kyi was the laureate of the 1991 Nobel [Peace] Prize for having attempted to establish democracy in Burma. An international symbol of peaceful resistance to oppression, she is still pursuing her non-violent struggle for democracy and tolerance in Myanmar." The jury also decided to attribute five Honourable Mentions, including a posthumous one to the late American journalist Daniel Pearl, "who lost his life for seeking to denounce all forms of injustice." The Wall Street Journal reporter was murdered by his kidnappers after he was abducted on January 23 this year in Karachi (Pakistan) while investigating Moslem fundamentalist networks. A second posthumous Honourable Mention was attributed to nine journalists killed in Afghanistan in the exercise of their profession in November 2001: Johanne Sutton (France, Radio France Internationale), Pierre Billaud (France, RTL), Volker Handloik (Germany, Stern), Ken Hechtman (Canada, Montreal Mirror), Ulf Stromberg (Sweden, TV4), Maria Grazia Cutuli (Italy, Corriere della Sera), Harry Burton (Australia, Reuters), Azizullah Haidar (Afghanistan, Reuters) et Julio Fuentes (Spain, El Mundo). Simon Wiesenthal and the Simon Wiesenthal Centre, in Austria, received the third honourable Mention "for their denunciation of the crimes committed by the Nazis during the Second World War and their work in education for tolerance and non-violence." The forth Honourable Mention was given to the Ramakrishna Mission (India) "for its unrelenting efforts to promote the principles of tolerance and non-violence in assisting disadvantaged groups." The fifth was given to Kids Can Free the Children (Canada), "a youth network which transforms children into local and international peace activists." The UNESCO-Madanjeet Singh Prize for the Promotion of Tolerance and Non-Violence will be presented in a ceremony at Organization Headquarters on November 16, International Day for Tolerance which is also the anniversary of UNESCO's foundation. The Jury is composed of five mernbers: writer and University of Abidjan-Cocody philosophy professor, Tanella Boni (Côte d'Ivoire); Nasser El-Ansary; Inder Gudjral, former Prime Minister of India; sociologist Julio Labastida Martin del Campo (Mexico), a former UNESCO Assistant Director-General for Social Sciences; Anatoli Torkunov, Rector of the Moscow State Institute of International Relations (Russian Federation). The US$100,000 Prize is dedicated to advancing the spirit of tolerance in the arts, education, culture, science and communication. It is awarded every two years to an individual or an institution for exceptional contributions in the field of tolerance promotion. The Prize was created in 1995 thanks to the generosity of Indian writer and diplomat Madanjeet Singh, who is also a UNESCO Goodwill Ambassador. In 2000, the Prize was awarded to Eyptian Pope Chenouda III, head of Egypt's Coptic Orthodox Church who works in favour of interfaith dialogue in Egypt and around the world. In 1998, it was shared between the Joint Action Committee for Peoples' Rights of Pakistan and Indian anti-nuclear activist and promoter of religious and ethnic understanding and tolerance, Narayan Dasai..